It’s 2:30 a.m., I’m in my bedroom, and I am under attack. Blue and red orbs hurtle towards me and I throw up my arms to deflect them, swaying back and forth to the angry snare hits in Led Zeppelin’s Achilles Last Stand. My actual arms—not pressing buttons on a gamepad. For a moment I feel as if I’m channeling that legendary warrior, my shields effortlessly casting aside these persistent projectiles. The song builds. I’m squatting now, punching my shields out towards the incoming spheres in time with the beat. This is the okay-it’s-sort-of-goofy-but-who-cares future: Room-scale virtual reality, powered by the Vive and SteamVR. If we chart the progression of video games from Spacewar and Zork all the way through to the 3D games of 2016, then the Vive is the next logical step towards realism. 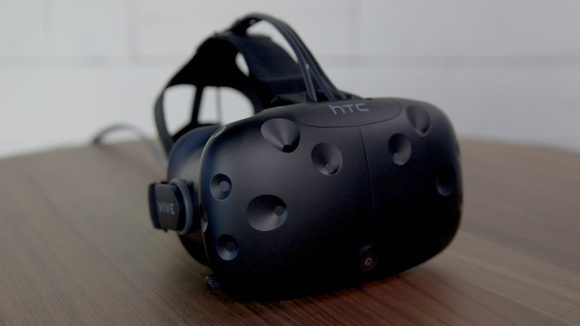 Or “immersion,” to borrow the most overused term in gaming—and the Vive delivers it in spades. It’s an awe-inspiring bit of tech, and the logical counterpoint to last week’s Oculus Rift review. Let’s dig in. For years it seemed like Oculus would make it to market unopposed. Sure, there were a half-dozen headsets from Razer, Sulon, and a host of other imitators, but nobody who could really compete with Oculus on specs and software. And then HTC unveiled the Vive. It was a shocking swerve, though the effect was maybe lost on those who don’t follow the industry closely. See, for years Oculus and Valve were actually partners. Valve fed Oculus its VR research for free, and many of Valve’s top VR heavyweights eventually left to go work in-house at Oculus. I’ve no way of knowing when that sunshine-and-roses relationship broke down, but I wouldn’t be surprised if it coincided with Facebook purchasing Oculus two years ago. Regardless, Valve announced the Vive about a year later, in the spring of 2015. And now, as of today, it’s a real product. As with the Rift, the Vive is a virtual reality headset. To paraphrase myself from last week, this means it’s essentially a monitor you strap onto your eyes, at which point lenses warp the 2D image into three-dimensional world that you can wander around. At its best, VR feels like you temporarily absconded from your bedroom/living room and teleported to a new and fantastical world—perhaps one in which you’re a dungeon-crawling hero, or an engineer building balloon cars, or a god who can shrink the solar system down to the size of so many colorful marbles. At the same time, we’d hear rumors about Valve’s “VR Room.” Valve would invite devs to its office in Washington where they had converted an entire room for inside-out VR—meaning, basically, that a camera mounted on the headset would map the walls of the room and warn you if you got too close. An entire room for VR. At the time it seemed incredible. Now? It’s a key feature of the Vive—sort-of. 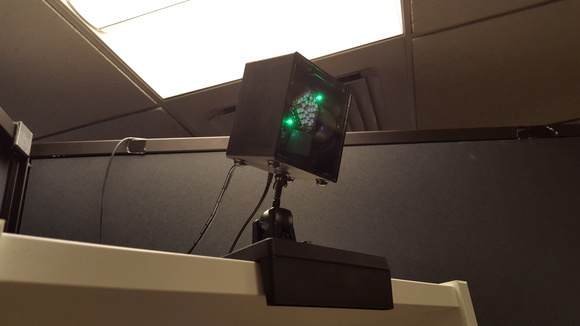 An early version of the Vive's Lighthouse sensor. To make room-scale VR work in a normal setting however, Valve needed to change up its approach. Thus the Vive works with outside-in VR, meaning the position of the headset is tracked by two separate base stations, which sweep lasers (The future is cool!) across the headset to determine its position in space. The concept is similar to the Oculus’s camera—and, in fact, you can use the Vive like the Rift as a stationary, seated VR headset—but the range on the Vive is a fair amount larger. 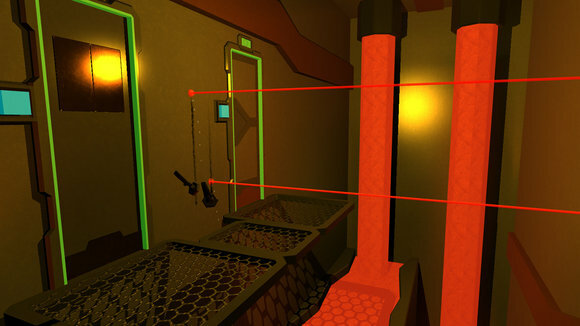 With optimal placement, the Vive can track an area up to fifteen feet by fifteen feet, though good luck finding a space that large in your house. Set-up involves placing the two base stations (together known as Lighthouse) high-ish up in your room—I have one on top of a shelf and the other mounted on my standing desk—and then calibrating the floor and the size of your space. It’s more intensive than the Oculus’s set-up, but done correctly it means you can physically walk around in virtual worlds—and, more importantly, can do so without worrying. If you get too close to the walls, Valve’s in-house “Chaperone” system simply fades into view, a grid marking the boundaries of your space and reminding you not to run full-tilt into your desk or whatever. And best of all: Set-up is handled from within Steam. We’ll go over the software side of things more later, but suffice it to say that as soon as you plug in a Vive, Steam downloads the necessary VR software. Easy. Rounding out the Vive experience is a pair of wand-shaped controllers which are also tracked by the Lighthouse base stations, giving you pseudo-hand tracking in VR and enabling you to swing a golf club, stab a goblin, shoot a bow-and-arrow, or throw donuts at a robot. Each controller features a trigger, two grip buttons, a Menu button, a button to call up the Steam overlay, and a trackpad—twin to the nifty haptic trackpads found on the Steam Controller, meaning each can be used as a mouse, a scroll wheel, or a bunch of buttons depending on the developer’s needs. And since you’re in virtual reality you can often look down and see what the trackpad is currently functioning as, which is a definite improvement over the Steam Controller. Not that most developers need more than a handful of buttons. Part of the Vive’s charm is that walking around is handled by walking around and the camera is handled by looking around and that means you can have pretty simple controls. Most games I’ve played use the trigger as the “Grab” command and…well, in a lot of cases that’s it. 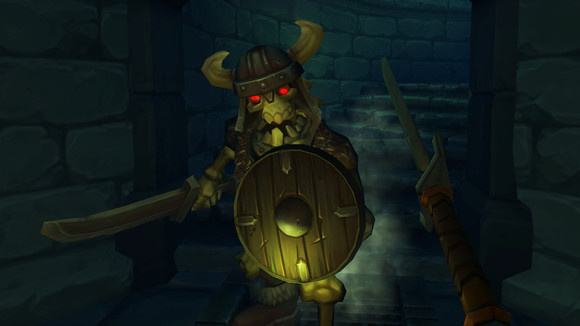 A few more complicated games have started experimenting with gesture-based controls. The Gallery, for instance, has you pull out your inventory—literally a digital backpack—by reaching over your shoulder, squeezing the trigger, and then pulling the bag out in front of you. Again, intuitive. Why is this important? Because the less people need to worry about controls, the more likely they are to stop thinking about “Oh, I’m in VR” and simply enjoy the experience. I’ve written at length about how disappointed I was by Oculus’s decision to package an Xbox controller with the Rift, and that feeling’s just as poignant now as it was a year ago. 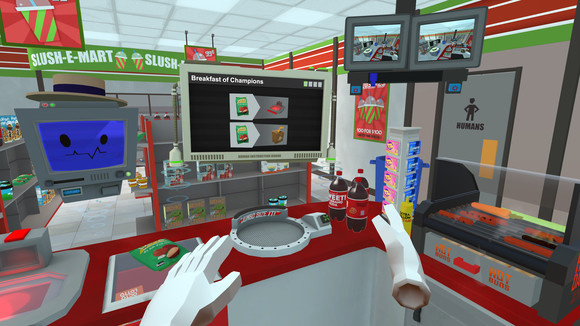 Job Simulator, an HTC Vive launch title. An Xbox controller only appeals to longtime gamers. To anyone else, it’s a nightmare. Try explaining to your non-gaming relative that they need to “Press the A button” when there’s a black box strapped over their eyes. Now instead, imagine telling them to bend down and grab the stapler they see on the floor. See the difference? I firmly believe if virtual reality is going to take off, motion controls are a key piece of the experience. 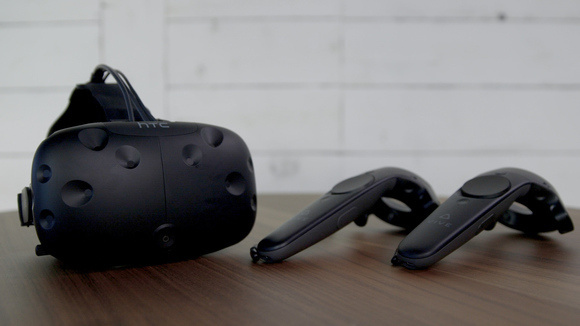 Packaging the Vive wands alongside the headset adds to the cost, sure, but Valve and HTC have put together a no-compromises vision of where VR needs to go: Room-scale experiences, intuitive controls, and extremely precise tracking. Now, does that mean the Vive is perfect? Absolutely not. I’ve outlined above the strengths of the Vive hardware—and there are many—but let’s talk about some of its deficiencies. Namely: The headset design. It’s the one place where the Vive really fails to hold its own against the Rift. And it’s not because the internals are worse. On the contrary, the Vive and Rift boast pretty much identical specs—90Hz refresh rate, 1080x1200 resolution per eye. The Vive’s FOV is a bit wider, the screens seem brighter, and there’s less light-streaking thanks to its circular lenses, but I think the Rift tends to focus better on objects close to the eyes and text generally looks cleaner. A draw, in other words. Compromises on either side. But Oculus put a hell of a lot of engineering work into the look and feel of the Rift. It goes on and off in one smooth motion thanks to its spring-loaded design. Once adjusted properly, it stays in place. It’s relatively lightweight. It has those neat little headphones that swivel down over your ears. Oculus Rift on the left, HTC Vive on the right. 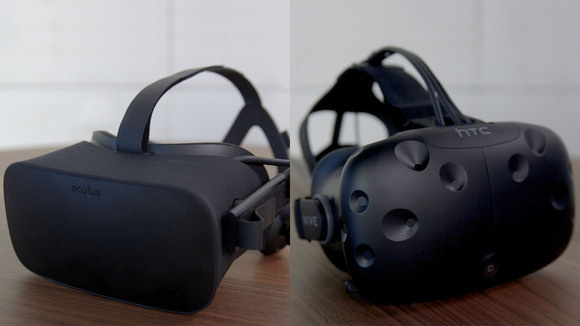 The Vive is more in line with the Rift’s second-gen developer kit (DK2, for short). It’s held on by a series of elastic bands, meaning it’s much harder to get the perfect fit. Most people will undoubtedly settle somewhere between “hangs too loose” and “crushes their face like a pulpy grapefruit.” The standard foam is hotter and somewhat itchier than what the Rift uses. The three-in-one tether is heavy. And headphones are a separate concern. There’s an audio jack hanging off the rear of the Vive, so you can plug in the included earbuds or bring along your own pair, but it’s one more cable to deal with. Personally I’ve been using Astro A50s because they’re wireless, but they’re also heavy and have a tendency to slip around when I look down. Don’t get me wrong: It’s not like these are major issues. If you’ve never used a VR headset before, the experience is undoubtedly going to be more important than quibbles about the tether or the headphone situation. But these material concerns are distractions pulling you back into normal reality—you know, the one where you’re wearing a goofy headset and a pair of headphones. As soon as you think to yourself “Wow, my face is hot,” or “Ugh, I think the tether is wrapped around my leg” you’re no longer wholly focused on the VR experience. Let’s talk about those experiences, shall we? As with the Oculus launch last week, I’ve gone ahead and split most of our discussion about software out into a separate article. But we can touch on the basics here. Surprise! There’s a lot of software. It truly is a surprise. Oculus put a lot of money into first-party development and struck a number of exclusive deals with third-parties. For months the launch narrative has looked like “Valve wins on hardware, Oculus wins on software”—a narrative that still seemed likely when Oculus launched alongside thirty titles last week. But never underestimate Steam. As of now, writing this on Monday afternoon (the day before launch), Steam says I have 62 Vive-ready programs in my library. More than double Oculus’s launch-day lineup, and there are some others scheduled for the April 5 launch that I don’t have access to yet. Now, there are other things to take into consideration of course. Oculus’s launch lineup was, I’d say, a more consistent quality. That’s what happens when you employ borderline-excessive curation and handpick every title. Valve’s done...well, what Valve does. You want to sell and/or give away a Vive game? Looks like Steam will take it. 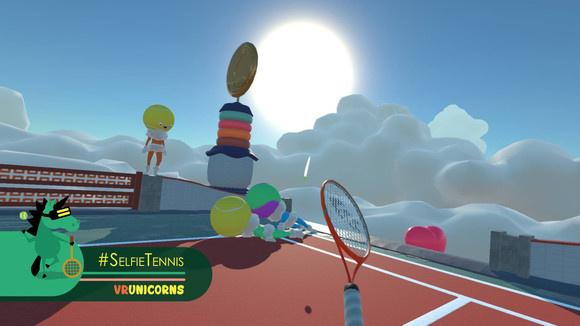 Full-fledged games like Job Simulator and The Gallery sit right alongside weird (pricey) experiments like #SelfieTennis and demo-scale experiences like TheBlu. And there’s no real telling what’s what. Meaning there’s a lot of chaff to sift through. The upshot though is that the Vive feels hands-down more interesting, entertaining, and surprising. Steam’s current Vive lineup reminds me of the early days of Oculus Share, a sprawling and lawless Wild West full of some of the most boundary-pushing, brilliant VR experiences possible. And also some really bad garbage. And some stuff that’s kind-of broken. Luckily Steam has its built-in reviews system, meaning the best of the best will be surfaced while the rest fade. Again: The fact that the Vive hooks straight into Steam is one of its best features, if only because Steam is a mature and well-established storefront with a ton of users. The other issue with Vive development at the moment is harder to solve though: Space. How much do you need? More space is better, a lesson I learned quickly the other night when I decided to check out VR Baseball – Home Run Derby. I held my Vive wand up like a baseball bat, squared myself on the plate, pointed to the stands like Babe Ruth, wound up and swung with all my might—straight into the side of my desk. Credit to the Vive controller for not shattering into a million pieces, though it bears a dent now as testament to my stupidity. It’s not that Chaperone didn’t work. It did, but I was moving too fast to stop. Something for developers to think about, maybe. But space is also a top concern for another category of games. The best thing about room-scale VR is the whole “walking around” bit, and some devs have taken advantage of that in some fascinating ways. Unseen Diplomacy, for instance, casts you in the role of a spy trying to infiltrate an evil lair—clambering over laser beams, crawling through vents, and et cetera. The problem? It’s designed in such a way that you basically go around in circles in an area without realizing you’ve been going in circles. And Steam tells me the minimum area required to play is four meters by three meters (a.k.a. 13 feet by 10 feet). I live in a tiny San Francisco apartment. I just barely managed to clear enough of my bedroom to meet the minimum room-scale size of 1.5 by 2 meters (5 by 6.5 feet), and I cheated a little bit by including a bit of my bed in the “cleared space.” Unseen Diplomacy is literally unplayable in my current setup. I never thought I’d see the day where I’d need to upgrade not only my computer, but my living space in order to play a game, but here we are. And what’s more: There’s currently no simple way for these “It’s one big room” developers to accommodate different room sizes. When I spoke to the Job Simulator developers recently they said they had to create three different room sizes by hand and then decide which to use based on what the user has calibrated. Some developers either can’t or won’t have the time to reconfigure their game three different ways to reach people with small San Francisco bedrooms. It’s not an issue for every game, or even most games. Many of the best experiences (The Gallery, Cloudlands: VR Minigolf, Vanishing Realms) use modular constraints and teleportation so the game is playable in any space. But it’s a real issue to consider if you’re planning to purchase a Vive. Do you actually have enough open space? Valve’s implementation of refunds for Steam games starts to look prescient. Video games have been one long journey towards realism. First, it was more realistic 2D graphics. Then realistic 3D graphics, from the earliest days of ray-tracing (think Atari’s Star Wars arcade game) to the PS1/N64 to the incredible virtual environments artists assemble nowadays. And there are some launch-day specific concerns too, like “SteamVR seems a little unstable recently.” I’ve had Steam get stuck in a cycle of “Launch, Run SteamVR, Crash” a few times, and that’s not great as we head towards release. All we can do is keep an eye on it, and hopefully the Day One woes are ironed out soon. But playing room-scale Vive experiences leaves me feeling giddy about gaming in a way I haven’t felt...well, since the earliest days of the Oculus. Walking around. Touching things with my hands. Truly inhabiting a space. These are logical next steps for virtual reality and for gaming, and it leaves the Rift looking backwards by comparison. Safe, even. Oculus claims people don’t really want room-scale VR—that people are lazy (I know I am) and don’t have a lot of space (I know I don’t) and just want to sit and relax and enjoy their entertainment. But by that argument, I don’t think most people really want VR at all. Not yet, at least. Not until they’ve experienced it. That shouldn’t stop us from trying. 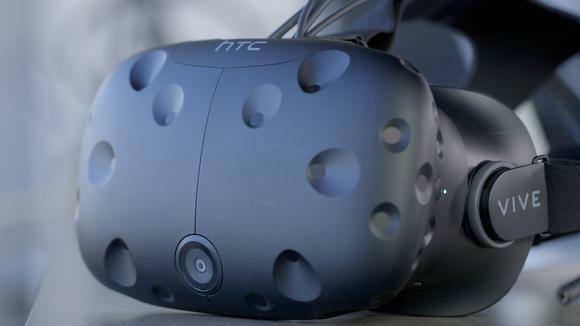 With the Vive, Valve and HTC have created what’s currently the most forward-thinking VR headset on the market. It’s wonderful.